Jessica Mauboy’s brand new single ‘Get ‘Em Girls’ will be officially serviced to radio at 7am this Friday, September 17. In the official announcement that’s come through from Sony just moments ago (which also included the official single cover image – pictured), the label has also confirmed that the album will also be called ‘Get ‘Em Girls’ and will be released on Friday November 05. The single will also be released on iTunes this Friday, meaning fans will be able to get their hands on it within a day of it being available to radio. For Jess fans, the full press release is included in the comments section of this post. 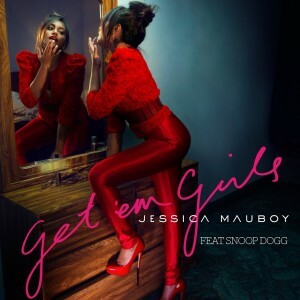 Jessica Mauboy is set to unveil her new single ‘Get ‘Em Girls’ featuring Snoop Dogg to radio this Friday, September 17th at 7a.m. Fresh from shooting the video with Snoop in LA, Jess ica is back in Australia to launch the single, which is the first taste of her upcoming second album GET EM GIRLS, to be released by Sony Music on Friday, November 5th, 2010. ‘Get ‘Em Girls’ featuring Snoop Dogg will be available on iTunes from this Friday. GET EM GIRLS is the follow up to Jess ica’s hugely successful debut solo album, BEEN WAITING, which has achieved double platinum sales and garnered Jess ica seven ARIA Award nominations. BEEN WAITING spawned a massive six hit singles including ‘Running Back’ featuring Flo Rida, ‘Been Waiting’ and the number one ARIA single ‘Burn’. From a shy teenager in Darwin , to writing and recording with some of the biggest names in music in LA and Atlanta , Jess ica Mauboy has come a long way since Australian Idol. It was in America , home of her musical heroes (Mariah, Whitney, Michael) where Jess ica discovered not only the sounds that would make up her second album GET EM GIRLS, but by and large, found herself as well. With GET EM GIRLS Jess ica Mauboy has found her true sound, and worked with the best in the business who have been won over and amazed by her staggering talent and her soaring vocal range. Jess ica co-wrote many of the tracks on GET EM GIRLS and besides Snoop Dogg, the upcoming album will feature collaborations with other musical luminaries such as Jay Sean, Ludacris and Iyaz. With GET EM GIRLS, Jess ica has grown. The production is first class, the sounds, thumping basslines and beats have a futuristic feel, and the vibe of an artist destined for bigger things outside of her own shores.